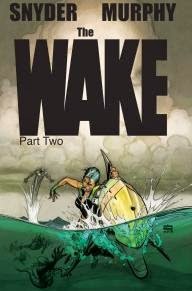 Part 2 of the Wake has been consistent and brilliant. The artwork is filled with awesome details especially when it comes to the characters and various vehicles/crafts and the story covers intriguing themes. It's my favorite kind of story with action, adventure, and fantasy. In this issue we find out a bit about Leeward's past and her fascination with trying to find a solution to the Mer problem. She gets caught by the government from the last issue and taken onto a gigantic ship to basically perform slave labor as punishment. The government, and just about all of the people we've been introduced to so far, don't exactly get on with the Mers, so I don't know why they are afraid of people looking for solutions/answers to the Mer problem. There must be some sort of secret government cover-up happening that connects all of these pieces together. That's my conclusion, at least. One of my favorite moments in this issue happens at the very beginning with the flashback to Leeward's childhood. The expressions on Leeward convey such authentic emotions. It kind of looks like something out of a Pixar film (and I think Pixar does a fantastic job of portraying emotions). There's hesitation, anxiety, and excitement all on Lee's adorable little face. That scene is important to the story, too, because it shows how Lee's father left the impression in her about uncovering the truth to the world. Leeward needs to escape off the slave ship, but it doesn't look good as she's caught by one of the guards as she's talking about her escape plans. This is all compounded when there is an attack by the Mers. I love the moments when the panels pull back and we get a clear image of the scope and magnitude of the scenes. Those moments don't need to happen a lot to be effective. So far, there's been a good balance of action and quiet scenes. I'm still surprised how much I like Part 2 of The Wake considering I didn't really care for Part 1 (also known as the first five issues). The ending is really cool for this issue. Be sure to check it out for yourself. It's definitely a twist I did not see coming. It's very enjoyable. I hope the dolphin doesn't hinder Leeward's progress. At the moment, I'm unsure whether it's a cute gimmick that needs to go or something that could be a great asset to her. I'll just have to wait and see what happens next.